Designer Sarah Hamilton is based in South London where she works in her studio creating colourful contemporary pieces. As Sarah states ‘My colours must sing – which is harder to achieve than it sounds – and is why my studio creaks under the weight of endless colour tests and samples!’. 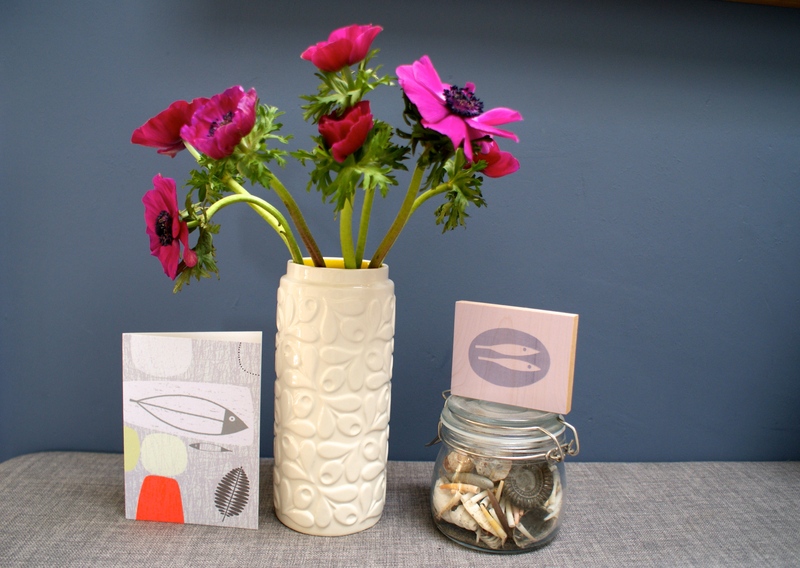 Sarah’s sea-themed woodblock and card sits happily in our home against a collection of ammonites and seashells with anemones in an Orla Kiely vase. Sarah’s work regularly features in the press to include Country Living, The World of Interiors, Country Homes and Ideal Home and has featured on a number of brilliant blogs featuring her work which you can find links to here. Her online shop hosts an array of beautifully designed products for the home balanced with her artwork – paintings, woodblocks, mirrors and furniture. This is topped off with her consultancy work providing creative design and marketing solutions for brands which includes work featured in Sweden. One busy lady! As spring is in the air with daffodils and brighter sunshine breaking through we couldn’t think of a more suited artist and designer to speak to for some inspiration on Great British design. Sarah, your work has a Mid-Century and Scandinavian feel which are currently incredibly popular styles. Who are the artists, designers and publications that most inspire and influence your work? So many things influence my work, from Artists including William Scott, Paul Klee and Georges Braque to architects such as Sir Basil Spence and Sir Denys Lasdun, however a common thread is usually the ‘less is more’ theory’. I gravitate to art, architecture and design which is clean, fresh and deceptively simple. As to publications, well, I enjoy a wide range of literature from classics to contemporary. I especially love books which have (and as an artist this is no surprise) a strong visual emphasis for example striking landscapes such as Snow Falling on Cedars by David Guterson or The Painted Veil by Somerset Maugham. The natural environment is very influential on my work and fragments of nature recur throughout my prints. 2. What’s the most satisfying element to working for yourself and designing without an agenda? There aren’t many creative disciplines where you have total freedom. I’ve often fantasised about being an architect but would find the limitations of regulations, funders etc hugely frustrating. It’s incredibly important to me to be able to make decisions without constraints. Sometimes, if I have a big selling design I stop making it simply because the constant repetition stops being challenging – the stuff of nightmares for business advisers but creatively it’s so important to me! I design objects which are simple in form, concentrating on the colour and textural relationships. I love paper with a passion so really enjoy making prints and cards etc. As to the homewares I tend to favour utilitarian items. We read on the blog interview you did with Life By Lotte your advice to up-and-coming designers being ‘skimp on food, heating, light, water but never ever compromise on materials’. To what extent are eco-credentials important to your work? Very…. every scrap of materials is put to use. I throw very little away and find a way to make something out of every leftover. I also, wherever possible, try to source UK suppliers to reduce air miles and support what’s left of our manufacturing economy, it can be more expensive but it’s something which is very important to me.I mainly use water based ink and am a skip diver when it comes to sourcing materials to build trade fair stands. I found one of my most used display units dumped on the street, thanks to whoever left it there by the way, it’s the perfect size! Making design look simple is really complex! How do you strip away the excess and know when a piece is done? This is by far the hardest part. It’s taken me years to develop my aesthetic of simple, crisp artwork based on contrasting colours, refined drawing and subtle texture. If it looks simple then I’m delighted….what’s unseen is all the tests strewn around my studio – it’s a long journey! Having ourselves discovered your work through twitter – how important is social media to your business development and success? Social Media has had an astonishing positive effect on my work life, and even impacted enormously on my social life. It’s a fantastic way to meet creatives, galleries, suppliers etc and, as artists, designers and small businesses it’s vital to embrace it as it has huge power. I’m currently running a campaign with Mollie Makes and The Design Trust called Just A Card. It aims to encourage people to support independent shops and designers and has had 100,000 hits on the Facebook page already which is quite astonishing! I also recently wrote a feature on this in UK Handmade magazine where I write about business issues for artists. 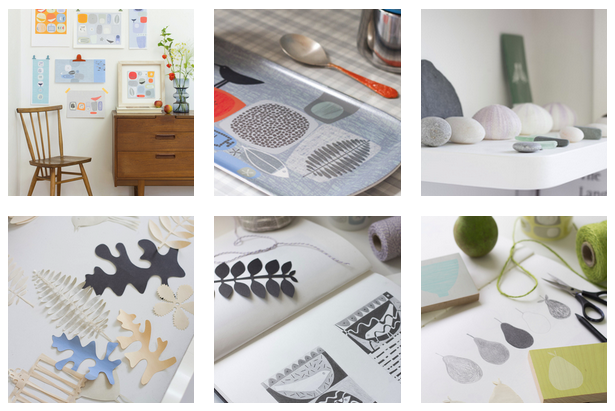 Your studio is being featured in the design book ‘Maker Spaces’ by Emily Quinton which is due out soon. How would you best describe your style and how does this translate into your studio and home? Martin Parr once said that all artists are collectors and he was so right. We have to surround ourselves with objects to refer to on a daily basis. Much of my artwork involves sequences of objects such as pebbles or collected leaves. This is reflected in my home and studio. There are collections of objects placed in relationships to each other.Luckily I’m quite tidy so the items I collect sit neatly on shelves (in our midcentury home in Dulwich, South London). I have eclectic taste – many charity shop and eBay finds. These sit alongside some design classics – I have a thing about lighting and regrettably often fall for rather pricy designer lights …. way better than shoes in my book! I just L O V E colour, as is reflected in my work. Similar to my work I use spots of colour in conjunction to neutrals around my home. Emily Quinton’s ‘Maker Spaces’ features my studio and the book is being launched on the 16th April at West Elm in Tottenham Court Road. The UK Makers featured in the book include myself, Vicky Trainer and Donna Wilson and we’ll all be having stands there so do follow us @emilyquinton, @SarahhamiltonPS for further information and come and join us – it’d be lovely to see you! Make sure you add Sarah’s Facebook & Twitter accounts to your feeds for some originality, creativity and colour! 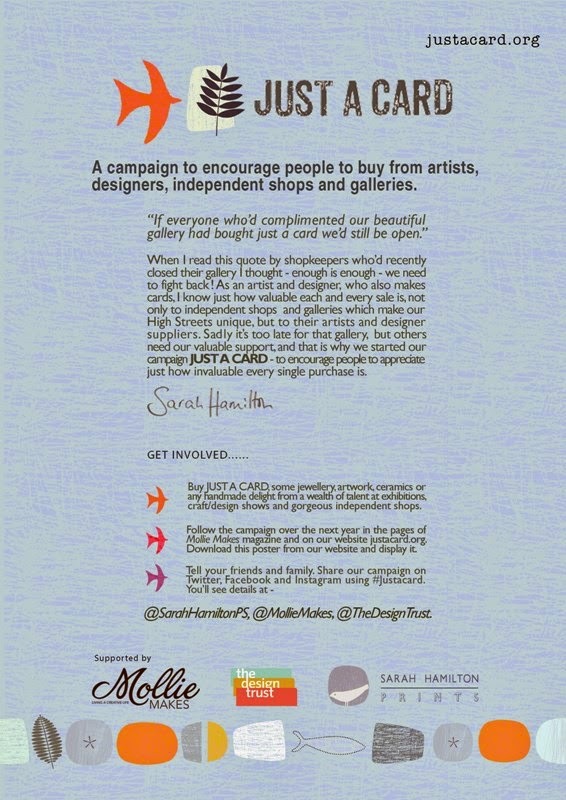 Follow and support the #Justacard campaign too – you can see more details below. Thank You!